So let’s begin…this week we have lunch with girlfriends at a trendy local café…what will we wear? First, I always consider the venue when making the what- to- wear decision. 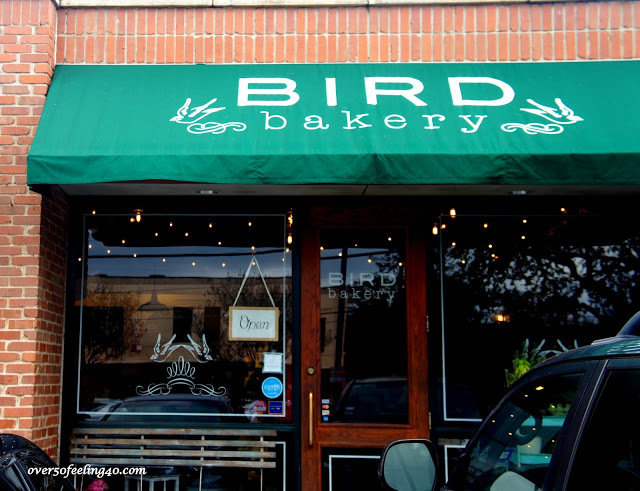 For this challenge, I might be meeting friends at a place such as BIRD BAKERY in San Antonio. It is in a very popular, vintage-style neighborhood and is causal coffee-shop fun. It sits near several trendy fashion boutiques, making this a stylish setting. So, first always consider location! Jennifer and I will approach these moments differently which we hope will give you many ideas and perspectives. 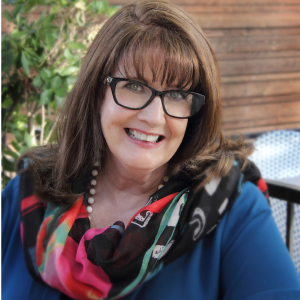 Jennifer is an experienced image consultant…and I am a women who went from sad and frumpy to joyful and confident!  When I turned 50, I experienced an AHH-HA moment (you can see the story HERE ) and in the past 12 years, I believe have completely found my sweet spot style. A style I believe says ME, and sends the messages I desire to say with my look. So, I hope it will help some of you to see how I formerly faced clothing issues in contrast to how I face them now. 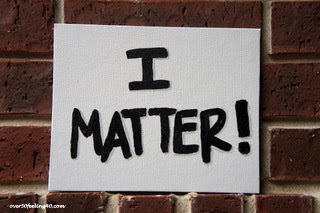 NEW HEALTHY THINKING: I Matter! Life is Short! I want to look and feel good for me…everyday! Now, I know most “experts” say that women dress for women (not really men), but I dress for me! 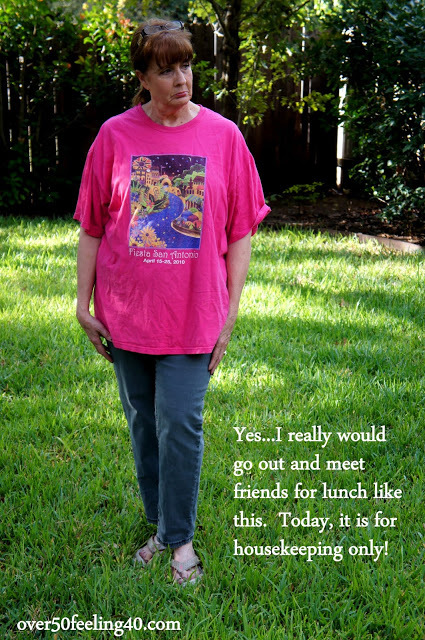 I do not let the fact that I am in my sixties, slightly pudgy, and on a very tight budget keep me from communicating with my clothing of choice that I am strong, joyful, confident and fun. OLD FRUMPY THINKING: This will do….this will have to do. I don’t really care (even though I did really care). NEW FOUNDATION THINKING: My new way of dressing often centers around neutral foundations with a statement piece made in the outfit somewhere. So, it might be in an accessory or a topper. 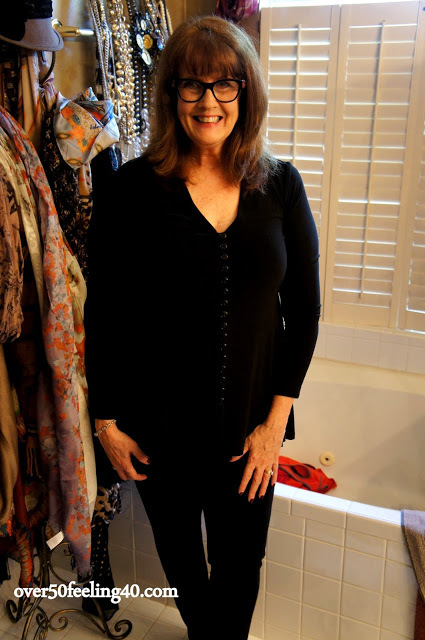 For this lunch, I began with a black foundation composed of JOAN VASS LEGGINGS and this JOSEPH RIBKOFF BLACK TUNIC TOP with the interesting buttons down the center. Little details like the buttons can make a big difference in the total look. Just wearing a plain, pullover tunic would have taken the outfit to a more casual place than I want to be for this lunch. Also, the V-neck opens my face and elongates my style (which is more slimming). NEW HEALTHY THINKING: Hmmm…popular location and I never know who I will meet or see there…opportunities are around every corner. The venue communicates an artistic, creative vibe…so if I wear this wrap (below), I will fit in like a missing piece of a puzzle. This is a more relaxed; yet polished lunch look. However, I can wear it for work though maybe not a business presentation. OLD FRUMPY THINKING: I believed everyone thought I was a frump and did not look at what I wore, much less on my feet. I did not get pedicures; and went everywhere in flip flops or athletic shoes. NEW HEALTHY THINKING: I matter from the top of my head to the tips of my toes! I do have feet “issues” however, so for lunch with the peeps I would probably wear leather flats. If I wear this same outfit to a fashion show or work event, I might wear my new BERNIE MEV HEELS just to pump up the look a bit; yet, remain comfortable. I am not able to wear the stiletto any longer…but I envy those who do! OLD FRUMPY THINKING: Handbags do not make any difference. The bigger the better. In fact, there were times I carried a grocery bag…sad, but true. NEW HEALTHY THINKING: Every part of me matters. If I want to communicate I am competent and strong, then I need a well organized, beautiful bag to complete my look. TA DA! Here is one idea of how I might dress for a fun lunch with the girls! I love this new Soft Surroundings ALLESSANDRA COCOON TOPPER. It is comfortable and oh so, stylish and artistic. I great way to make a neutral foundation pop! Look for more ideas on SOFT SURROUNDINGS SWEATER AND CARDIGAN PAGE. Now, for more direction go join my friend, Jennifer, HERE AT A WELL STYLED LIFE..we will be doing this every Sunday, so please send us your questions or suggestions! I am at over50feeling40@gmail.com! 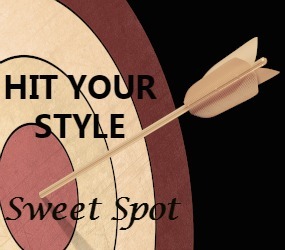 We love to hear from you and want all of us to hit our style sweet spot! Also, look for more guidelines on Thursday on a new Pinterest page. 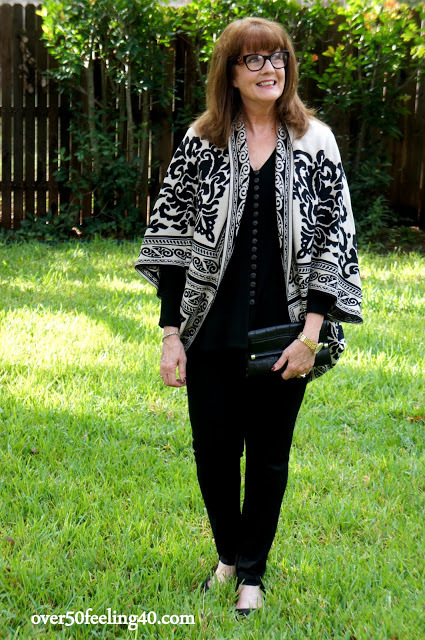 For more Sweet Spot Style ideas…follow me on Instagram at pamover50feeling40 and Twitter @over50feeling40! Hope your week includes special occasions! This is such a great series! I look forward to your and Jennifer's posts on Sundays! You are so right, how we dress really makes a difference in how we feel and what we project. I am only in my mid 40s but recently really started paying attention to how I dress and it really makes a difference. I really like your outfit. The topper is gorgeous – it looks like a wrap but with arms – which is very useful (I have two wraps without arms, which prove a bit difficult to wear and "live life")! Lovely bag, too! Thank you, Andrea! I so appreciate the encouragement! Yes, this is a wrap with arms so it stays in place much better than a traditional wrap or Ruana. It works perfect for lunch with the girls! Have a wonderful day! Hi Pam, looking forward to this new series. What a transformation and such an inspiration. Thank you. Thank you, Tricia. Very Kind! Have a wonderful week. I love that top! I may just have to copy you and get one! Great fun doing this with you. I wish we really could go to lunch together. Great idea, Pam! Looking forward to this series. Thanks Susan…I hope it will be helpful. Gorgeous! You have inspired me of late. I bought a beautiful shawl for a friend and she asked me if I'd gotten one for myself. "I don't wear them," I responded. Then, I wondered, "why not?" A few days later I went to the Santa Fe shop where I'd bought hers and yes, got one. I'm going to up my fashion game from here on out, thanks to you. 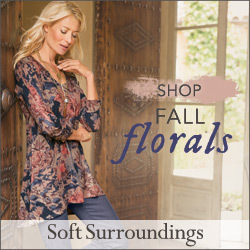 What better place to up your game than Sante Fe…the color and inspiration is every where! Thanks for the comment and I am so glad you got a shawl for yourself!! Let us know how you are doing in your endeavors to up the game, Carol. I was sad during those years! My makeover and new ways of thinking have kept those smiles going. Thanks Patti! 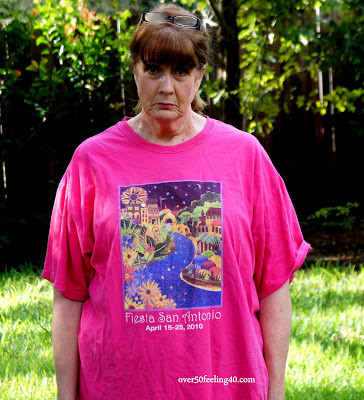 I really lived in tee shirts for years, Donna and looked like that far too often. Now, I am resistant to tee shirts…every now and then I might stick one under a jacket with denim…but I usually Life is Too Short for Tee Shirts! Thanks for the encouragement Donna! 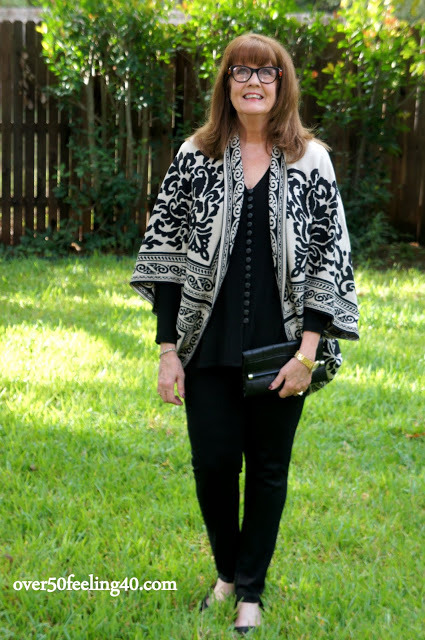 Really Pam you have gone in this one post from ho-hum, to gorgeous and glam! stylish and chic!! I love your thoughts on dressing and style always! !I I hope you will visit my India Hicks Style site! Karena, you are always so king…I did visit and your new venture looks like fun! This is such a wonderful idea for a series Pam. Sometimes we just don't know where to start! You always look so lovely, and are such an inspiration for me! Thank you for the encouragement, Lana!! Have a wonderful week. YOU have a BEAUTIFUL face!I want you to change your photo that appears on the comments because it LOOKS NOTHING LIKE YOU!! !Your hair color and all is STUNNING! You have TRANSFORMED yourself B E A U T I F U L L Y!I applaud YOU! !The scarf rack in the bathroom is PERFECT TOO!!!!!!!!!! !I may copy YOU! You are so sweet to say these things! It has been about three years since I started using that photo. Maybe it is time for a change! Thanks for the idea. BTW…Love my scarf rack…at least I can see them and get ideas for using them each morning! Excellent post. I love your I Matter theme. Thank you Laura. It took me too long to realize I do matter! But, I try to help others see how important it is to believe this! Wow, what a transformation! You look fab. What was it that changed your thinking? Tell us the story. Hi Sandra, My story is told briefly on my MISSION page above. But, it was a driver's license picture which got my attention and eventually resulted in a new, reinvented ME! What a great look! And, thank you for the reminder to respect ourselves enough to shed the frump. I loved how you shared your journey and I look forward to following your blog. Thank you for the encouragement! I hope you will come back…have a great day! Great idea that should generate a lot of interest. Look forward to these Sunday posts. Thanks Karen…we hope it helps and inspires! What a fun idea! I'm a fan of Jennifer's too and I look forward to seeing what each of you has to share on upcoming Sundays! Thanks so much Elaine! We are really excited about this! Love this idea. How to turn things around to get the postives from life. Love your outfit. Thank you so much…life is too short to dwell on the negatives! You look fabulous and the joy is evident in your smile! I will be following along on this fun series and think you two have the right attitude. Thank you. Thanks so much! Glad you will be with us…and I have been smiling every day since I turned things around! Such a lovely and inspiring read, Pam! I didn't even recognize you in your first photo. I also dress for me and it has made such a difference over the past few years. Now I wish I had started so much sooner. I hear you,…I regret it took so long, but try not to live in regrets but the possibilities of today! Pam, This a fabulous reminder. Sometimes little by little this can happen. Love the shoes. Maybe you have some suggestions for night clothes also. Sometimes I know I lean a little toward frumpy but I do want to stay warm and be comfortable. Have a wonderful week. We will try to work night clothes in, Lynne. Thanks for the suggestion. Next Sunday is casual date night! I am over from Jennifer's blog! I love your down to earth approach to the series by starting off in a souvenir t-shirt and jeans! You wear leggings very well. Your choice of lunch with the girls attire makes you to appear to have dropped two sizes! I look forward to next Sunday with my coffee! I love leggings! I studied stylist and fashion advice for years in order to know how to slim my look. I am much larger than this outfit shows. Work with us, Carla! It took me time, study, experimenting to get to where I wanted to be. But it was fun! Thanks for reading! Well done! Sounds like a fun collaboration. I think it is going to be a lot of fun, Barbara and I truly hope it helps and inspires others. Love the transfromation of outfits and how you emphazied your thought process of creating a whole new look and vibe for lunch with the girls! My frump happened during my young mommy years, Nicole! I am glad bloggers like you are there to help and inspire the young mommies of today! Thanks for stopping by! I love your new idea. Sounds fun! And Pam…Love your outfit this week. You always look sensational! You are so sweet Nancy…I need to keep eating those healthy recipes you post! Thank you Catherine…you are one of my inspirations! Love this post – I'll be checking you out each week! The biggest difference ,of course, is attitude; the smile is the winner. What a great idea! You look FAB!! This is such a cute post – you look fabulous in your new "I matter" look! Well done you! This is wonderful! In fact, I am featuring this post in my weekly Little Bits of Inspiration series on Saturday! I was the same as you once I had kids in my mid-thirties. I figured hat was a mom's life, just getting clothe on was enough and no one expected anything more of me. But I started expecting more at 41 and decided no more sloppy mom-wear. It's just as easy to put together a flattering outfit that is just as comfortable as sweatpants! I am finding that tights and a dress really are just as comfy! And because I look better, I feel better! Thanks for this post! It is such an important reminder to tae care of ourselves and be proud of how we look! Btw, Your black and white look is fabulous! Well, you've clearly dumped the frump and embraced your stylish you w/great, well…………style!!! As an over 60, I believe now, more than ever, that paying attention to how you look, how you put yourself together and how you present yourself to the world makes every bit difference in the world. I have been preaching on that soap box for quite some time, and you are a perfect example of doing it right. Pam, what an inspirational post…our thinking really does have EVERYTHING to do with our perceptions and our actions! 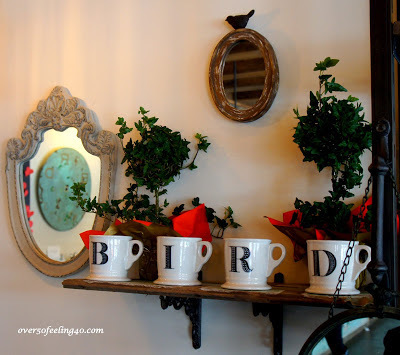 Thanks for sharing your refined style with the My Refined Style linkup.